On 19 May 1915 more than 40,000 Ottoman troops attacked the Anzac perimeter, determined to drive the invaders back into the sea. At The Nek, Arab and Turkish infantry made repeated attempts to breach the Anzac defences, each attack collapsing in the face of accurate machine gun and rifle fire. An estimated 3000 Ottoman soldiers died during the failed attack, and their bodies were left to rot in No-Man’s-Land alongside Anzac dead from earlier battles. 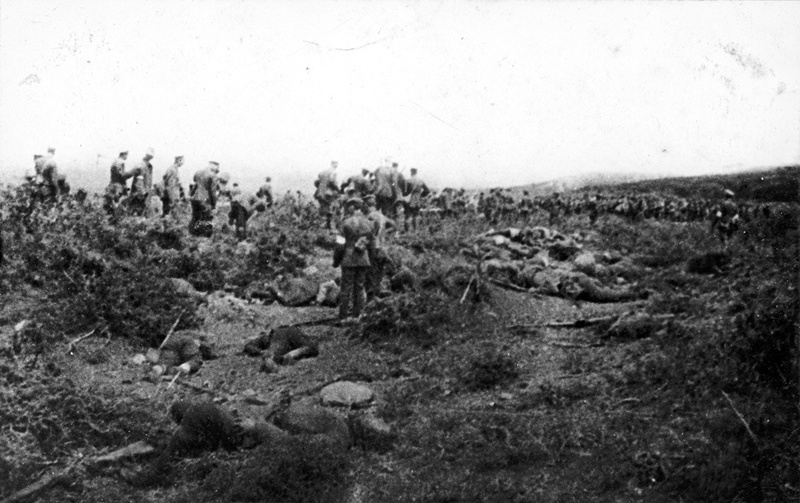 The fouled state of the line became too much to endure, and both sides agreed to a 24-hour truce on 24 May 1915 to bury the dead. Sources: New Zealand History Website; Quote from Charles Saunders, New Zealand Engineers, in Gavin McLean, Ian McGibbon and Kynan Gentry (eds), The Penguin Book of New Zealanders at War, Penguin, Auckland, 2009.